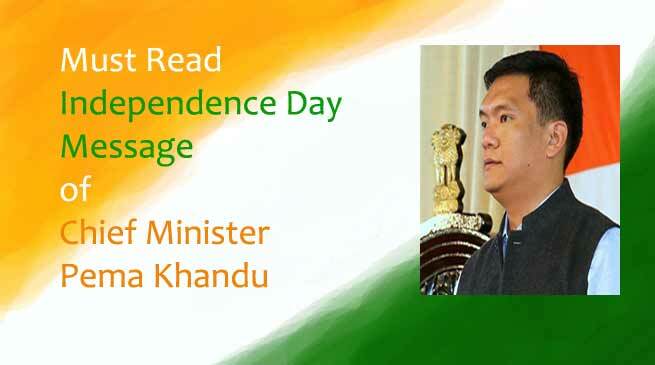 On the occasion of 71st Independence day , Arunachal Pradesh Chief Minister Pema Khandu on his massage said that, ” his government focused on systemic reforms, transparency and efficiency in govt work system, strengthening the vigilance mechanism, bridging the rising unemployment problem, improvement in education and health sector, and many more developmental activities of the state. The complete massage of chief minister pema Khandu is mentioned below . On this joyous occasion of 71st Independence Day, I extend my heartiest greetings to the people of Arunachal Pradesh and pay rich tributes to all those great souls because of whose struggle and sacrifices, we are breathing the air of freedom. In the last one year, our Government focused on governance related systemic reforms to build a solid bedrock of administration. Cadre review at all levels- State Civil Service, State Secretariat Service and many other service related lacunae in the administrative system was promptly and comprehensively taken up. I am optimistic that with these reforms our employees will rise to the occasion and dedicate themselves to the development of the State with renewed zeal and enthusiasm. Probity in public life is expected from public servants while discharging their duties. In addition to strengthening the vigilance mechanism, the government has decided to set up the Arunachal Pradesh State Human Rights Commission and make functional the State Lokayukta. This will usher in a fresh chapter of transparency, accountability and responsibility of the government and its agencies, besides checking corruption. To ensure transparency and efficiency, DBT mode of transferring benefits, online registration for examinations, e-Human Resource Management System, e-Cabinet, e-Office, e-ILP, e-Ticketing and CPGRAMS, has been set up. In order to bridge the rising unemployment problem, we launched the Pt. Deen Dayal Upadhaya Swavalamban Yojana and Pt Deen Dayal Upadhayay Bunkar Yojana to encourage enterprises and entrepreneurship this year. We have also launched the Chief Minister’s Krishi Rinn Yojana to provide zero percent interest Crop Loan to farmers. In order to overcome the challenge of skilling our youth that can match international standards, our government will be sponsoring students to reputed skill institutions. Our Government has approved creation of a Department of Indigenous Faith & Cultural Affairs for preservation, protection and promotion of our rich indigenous cultural heritage. With the decisions of doing away with no detention policy, smart classroom, rationalisation of teachers and relaxation of recruitment rules, hopefully, our state will see drastic improvement in the education sector. The restructured health care model, which is universal, affordable and accessible, will be implemented soon. Chief Ministers Free Chemotherapy facility for cancer patients has started at TRIHMS Hospital. Trans-Arunachal Highway is making rapid progress paving way for the fountainhead of our economic transformation. Arunachal Pradesh has the largest number of un-electrified villages in the country. Our Government will take up this task on a war footing and ensure that all 1230 un-electrified villages are electrified by December this year. The Advance Landing Grounds in the state are ready and will soon be operating flights from Guwahati to Pasighat. Honourable Prime Minister has set a national target of declaring all rural areas as Open Defecation Free by 2019. We have decided that we shall strive to meet this target by the end of this year. Let us join hands to achieve this goal. On this 15th day of August, as we celebrate our freedom, let us take immense pride in being an Arunachalee but at the same time display by our actions to take up the challenges that lie ahead of us and join Team Arunachal and make Arunachal self-reliant and a happy state. Let us be law-abiding citizens and help our state remain forever the Island of Peace.